If you have a learner who likes building things and figuring out how things work, they will love this class. Join us as we explore, investigate, & solve problems while we learn about the building blocks of engineering-simple machines. Students working in pairs will enjoy hands-on activities using LEGO Gears and special Technic engineering components that incorporate math, science & creativity. 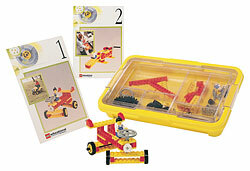 Students will work through building models that demonstrate mechanical and physical engineering. They will then use what they learned to solve challenges. Learning projects may include: mini mechanical concept models, a moving dragon, scale, clown, crane, car, fan, merry-go-round, and more.